Ok, I struggled to come up with a good name for this but trust me…even with no name, you want to make this! One night, at our local Mexican restaurant (we’re regulars! ), I mixed together the homemade guacamole and salsa. So delicious…perfection on a chip! Kind of like guacamole with pico de gallo’s less chunky cousin. It has been recreated many times in our house since. Let’s make our salsa first. It’s super easy. Throw the whole tomatoes in the food processor and give it a whirl. Then, add everything else in and pulse until you get the consistency you want. Ready for the magical final step? Mix the two together! – I mix them together in small batches as we eat instead of all at the same time. – I have also taken the super lazy route and mixed Jack’s salsa with Wholly Guacamole Spicy Guacamole too. 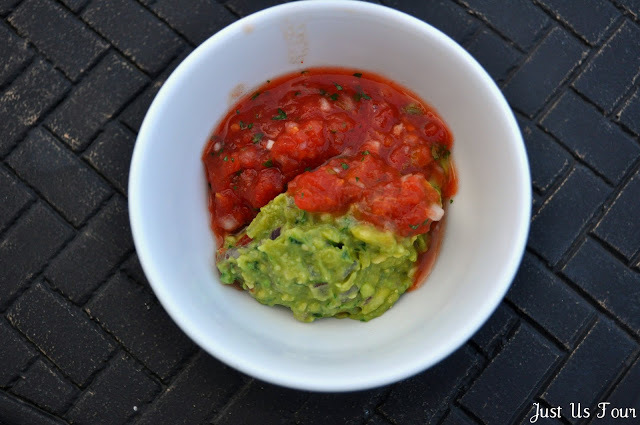 A combination of the two best Mexican items: guacamole and salsa! For the guacamole, remove the seed from the avocado and spoon into a bowl. Mix in all the other ingredients and smash to combine. Yum. I’m not a fan of mexican food but ilove salsa and guacamole. What a greatbidea to combine the two! Yum! That sounds like the salsa I make…with canned tomatoes too! I just discovered that I love avocados. Love em!! Thanks for stopping by my blog!! ooooh that looks so good! I never thought of mixing the two together. yum! This salsa sounds so good right now! Oh yum, please pass the chips! yummy!I’m from Texas and we pretty much each salsa on everything! Then ya gots to have the refried beans and sour cream! Stopped in from Southern Lovely’s Show and Tell.